Plato’s Chair is a performance work by UK artist Rose English that toured extensively throughout the 1980s, receiving many acclaimed reviews. This enigmatic tour-de-force is a demanding, contemplative, and captivating performance in two parts that also serves as a demonstration of English’s technical virtuosity as a trained stage actress. Plato’s Chair borrows from many theatrical methods and motifs, including the use of monologue, entr’actes, props and costumes from the artist’s previous performances, choreographed and improvised movement sequences, and dramatic emotional expressions, all of which are reinvented and repurposed throughout the performance. In this work, English continuously makes references to past, present, and future performances, raising philosophical questions about death, the soul, and the void, while insisting that she may or may not be referring to these subjects. Everything that occurs in the performance is a shadow of something else, and, as the title suggests, Plato’s Chair exists in its ideal form not as a physical manifestation, but within the realm of the subject’s mind. 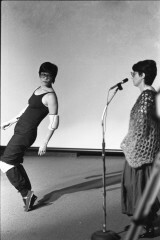 Consequently, many of English’s efforts are subjected to delay and repetition, restrained by performance art’s essential existence in the present. Choreography functions as an important device in the work to supplement some of its more conventional linear narratives. Movement, in its most fundamental and basic form, serves to propel the performance forward, indicating a change or a development in the scene. For the viewer, such spontaneous movement sections offer some motivation to keep the show going, especially when there is “no topic,” as English suggests. Throughout the piece, the artist’s requests for a “short bit” or a “long bit” invite an audio clip to play from the opera Carmen, Act 1: Entr’Acte. During these sections, English walks around the stage, deep in contemplation, or else runs around in circles, dances like a ballerina, and thumps her chest. The straining of the performer to undertake these various forms of physical and intellectual exercise eventually mirrors the endurance of the audience as they are confronted with philosophical dilemmas of immanence and opacity, perpetually refused the escapist experience they may have been expecting. English’s use of exaggerated breathing heightens this effect. 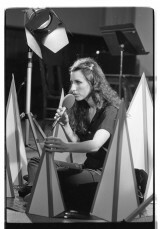 As artist Judy Radul describes, “sometimes she uses the mike [sic] for her anticipatory inhalation, then puts it down for speaking. The impulse to act or speak is acknowledged whether it is followed through or not.” The self-reflexive nature of the performance also exposes and challenges conventional representations of female characters. Picture the artist Rose English wearing a tiara and dancing like a ballerina, contrasted by displays of her carrying a log, cocking a rifle, wearing Mickey Mouse ears and a horse’s tail and hooves. Throughout the performance, English commands the viewer’s attention by veering in unexpected directions to create a sense of discomfort. 1 – English, Rose. “About Rose English.” Rose English Performance. Accessed April 2018. http://roseenglishperformance.net/About. 3 – Straine, Stephanie. “Five Artworks from Tate Liverpool’s Keywords Show.” TATE Liverpool. March 17, 2014. Accessed April 2018. http://www.tate.org.uk/context-comment/blogs/five-artworks-tate-liverpools-keywords-show. 5 – Radul, Judy. Whispered Art History: Twenty Years at the Western Front. Ed. Keith Wallace. Vancouver: Arsenal Pulp Press, 1993, 214-215. 7 – In 1980, English a psychoanalytical feminist article titled Alas, Alack: The Representation of the Ballerina on the fetishization of the ballerina in the Romantic era ballet tradition, published in a special women’s issue of New Dance magazine. 8 – Rideal, Liz. “Plato’s Chair.” Performance Magazine, September/October 1984, 7. Accessed April 2018. http://www.performancemagazine.co.uk/wp-content/uploads/2017/03/Performance-Magazine-31-Sept-Oct-1984.pdf. A one-woman opera/performance based on a trunk full of costumes. The most memorable image was English with a horse’s ail and hooves, galloping around the stage with a large log in her hands to music from Carmen. The piece was, among other things, a deconstruction of traditional attitudes towards women on stage.